The cyclone tore through the country bringing damaging winds and torrential rain but is now moving away to the east. 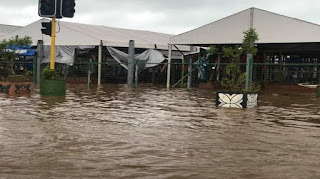 Ulu Bismarck Crawley, from the Ministry of Natural Resources and Environment, said the entire country has been affected, but worst hit are the north coast and riverways prone to flooding. He said there were no reports of injury or death but emergency services were focusing on people isolated by the effects of the storm. He said lines companies were reconnecting phone and electricity services now that roads were more accessible as flood waters receded. "The assessment is continuing," he said. "Our respective agencies of government are doing the assessment and they're reporting back to co-ordinate all the efforts but we had the first meeting of the council this morning and based on that, we have a better idea of coordinating for proper programmes. But we're just focussed on rescue and evacuation now." RNZI reports the rain had caused rivers to burst their banks, flooding many houses. The disaster management office said more than 200 people were in evacuation centres around the country. There were strong winds through the night, which had uprooted trees and ripped off roofs. Several main roads were blocked and power was out in Apia. The country had experienced severe downpours for much of the week, and the cyclone had only added to the misery. The south coast and the neighbouring island of Savai'i, also appeared to have borne the brunt. In American Samoa, where today is Friday, power had been knocked out in large areas and businesses and schools were ordered shut as the cyclone moved towards the territory. There was also flooding there, and debris was strewn around the district. The National Weather Service's office in Pago Pago had lost power and data and forecasts were now being sent from the NOAA's office in Hawaii. American Samoa's governor, Lolo Matalasi Moliga, said the cyclone had caused a lot of damage to homes and utilities. Governor Lolo has made an emergency declaration, saying it's likely the territory will ask for assistance from the United States.